Home Baby Safety What is Meningitis and How to get rid of Meningitis In Babies/Infants? What is Meningitis and How to get rid of Meningitis In Babies/Infants? What is Meningitis and How to get rid of Meningitis In Babies/Infants? Meningitis can affect you and your baby with equal ferocity. It can be termed as the inflammation of the meninges as well as the spinal cord and membranes of the brain. In fact, the bacteria which cause meningitis in babies has been consistent, comprising Group B Streptococcus (GBS), followed then by Escherichia Coli (E. Coli), Listeria Monocytogenes and Streptococcus pneumonia. A virus or bacterium that travels through the bloodstream causing an infection. Meningitis can also be caused by a fungal infection; however, it is less common. What is Meningitis and How to get rid of Meningitis In Babies/Infants? This is discussed below. Meningitis that affects babies (around 2-3 months old) is called neonatal meningitis. It should be noted that the virus can be quite serious when it affects babies. If you do not heed the signs and warnings, it can cause deafness, intellectual disability, and even death in babies. Bacterial Meningitis mostly affects children above the age of 5 years. It is more common and is milder than meningitis caused by bacteria. It lasts for around 10 days. Coxsackie, a virus that causes mouth and hand disease; it usually leads to meningitis in infants. Mumps can also cause meningitis. How Do Babies Contract Meningitis? The organisms which cause the sickness can be found in the throat and mouth of babies. Babies with immune systems that function abnormally. Sick-cell disease can also cause the sickness. Babies with head injuries are also prone to the virus. A pregnant mother can be infected with the virus which is then passed on to the child. 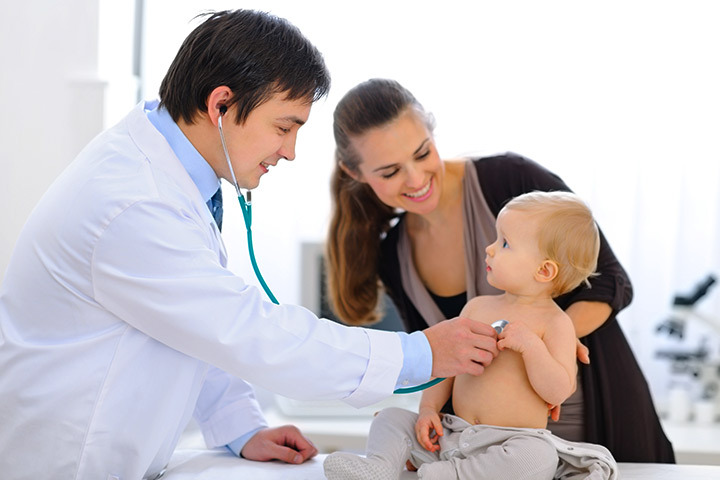 If you feel that your child has some of the symptoms mentioned on the list, you should take him to the doctor immediately to avoid late diagnosis. The doctor may opt to conduct a lumbar puncture, which is also referred to as a spinal tap. In some cases, a doctor may order for a CT scan to be conducted before actually going through with the lumbar puncture. This is done to rule out other symptoms and offer a concrete solution. Urine and blood samples will also be taken before the actual lumbar puncture is conducted. Medication prescribed by the doctor after thoroughly examining the symptoms, especially in the case of a newborn. Medication would be required to lessen the fever. Plenty of rest and relaxation is required in order for your baby to gain his full strength back. Pamper him with whatever he requires making sure that he is back to full health in no time. Hospitalization may be required under doctor’s orders to observe certain irregularities in health. Children suffering from bacterial meningitis would require hospitalization and aftercare because of the severity of the virus. In order to completely eradicate the bacteria from the immune system, listed below are some of the treatments required: 1. Strong antibiotics will normally be administered to your child in order to purify the bloodstream infected with the bacteria. 2. Hospitalization is a must; your child will be connected to an intravenous drip to replenish lost fluid from his or her body. Ensure that your child washes his hands before and after every meal as well as when he returns from the playground. He should also wash his hands after going to the toilet. You will need to cover your mouth when coughing to prevent your baby from contracting the virus. Use a tissue or your arm in such cases. Teach your baby the same habits too. Make it a point to keep certain contaminated surfaces clean like remote control, toys as well as doorknobs. Use a disinfectant in these cases. You should avoid sharing beverages, toothbrushes, utensils and other personal items with your baby to prevent passing on the germs. Ensure to keep your house free from rodents that contaminate surfaces as well as food. Use rubber gloves when wiping the surface with disinfectant. Try and avoid getting bitten by insects and rodents that transmit certain deadly viruses. Meningitis in babies can be as harmful if not taken care of properly. Therefore, taking a second opinion from a qualified doctor is always necessary. We hope that the information shared will help you tackle the deadly meningitis virus or bacteria more effectively. Do share how you manage to prevent your child from contracting the disease.